We are excited to continue our Spotlight on a PERT series with a focus on the Emory program in Atlanta, Georgia. This program encompasses two hospitals in the Emory Healthcare system; Grady Hospital and Emory University Main Campus. Each month we send a set of questions to a different PERT from around the country to get a sense of how they handle pulmonary embolism at their institution. 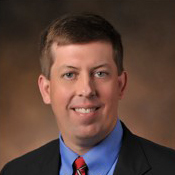 This mini-interview, this month with Dr. Brent Keeling, is then shared with the whole Consortium to help new PERTs get started and give experienced groups a “behind the scenes” look to see how others work. As always, check us out on twitter (@PERTConsortium) for more updates or with insights into how you run your PERT and please click on the one-question survey below to give us feedback about the utility of this email. We began organizing as a PERT in late 2012. The PE team first started at Emory University Hospital Midtown (EUHM) under the leadership of the late Dr. Ken Leeper, who felt many patients with intermediate-high risk and high-risk PE would benefit from more aggressive therapies such as surgical embolectomy, catheter directed thrombolysis, and systemic thrombolysis. Before the concept of pulmonary embolism response teams was introduced, Dr. Leeper was already practicing the PERT ideals at EUHM with multidisciplinary consultation and novel out of the box thinking for decades. In 2012, we brought multiple specialties together to formalize Dr. Leeper’s vision for multidisciplinary aggressive PE management. This resulted in the formation of treatment algorithms, order sets, protocols, and quality registries for the treatment of PE. Eventually, Dr. Leeper’s vision of PERT teams expanded to Grady Hospital and Emory University Main Campus. We have a number of disciplines represented in our PERT team including cardiology, interventional cardiology, cardiothoracic surgery, vascular surgery, hematology, critical care medicine, emergency medicine, pulmonology, and interventional radiology. The first call for the PE team varies depending upon the hospital. At EUHM, a few cardiologists and pulmonologists share the first call for the team and then bring in other specialists depending upon the specific patient. At Grady, the MICU team serves as the first call for the PE team and vascular surgery, interventional cardiology, and cardiothoracic surgery are contacted for most submassive and massive PE patients. At Emory main campus, the first call for the PE team alternates between the MICU and CCU. The PE team is activated at each hospital via central page. Each hospital has a dedicated PE team pager number and a call calendar assigned to the first call physician. If multi-specialty group discussions are warranted, then group texts go out to the other specialists to build consensus on treatment strategies in semi-real time. We have tried GoToMeeting and conference phone lines, but have not made these technologies work and find phone calls, emails, and text messages usually works best. The best interactions are always when multiple PERT members gather at the patient’s bedside and communicate directly with one another and the patient/family when possible. This is usually possible on hours for submassive PE patients, but harder to accomplish off hours and with massive PE. In these cases, the team often relies on texts, emails and phone calls to communicate. We firmly believe (and are beginning to publish data to support our belief) that large, potentially life-threatening PE’s are mechanical problems that demand mechanical solutions. As such, we have been aggressive in pursuing surgical and catheter-based interventions for significant PE’s and have seen the number of these interventions rise as a result of our PERT experience. At all three of our hospitals, we are now able to offer full and half dose systemic thrombolysis, catheter directed thrombolysis, surgical embolectomy, catheter embolectomy (penumbra or Inari), and/or hemodynamic support with ECMO or RP Impella. We would love for our PERT to become even more active in research and quality improvement to better understand how to best treat patients with higher risk PE. We are currently enrolling in the FLARE trial investigating Inari pulmonary embolectomy in submassive pulmonary embolism. In addition, there are other very important research trails coming down the pike investigating other novel therapies in high risk PE. We view the role of our PERT to investigate novel PE therapies to provide a better understanding of the role of these novel technologies in the treatment of high-risk pulmonary embolism. Start one now!!! Life-threatening PE’s benefit greatly from the input of many people with a significant interest in the disease and with a variety of specific skill sets. Patients benefit from the team-centered approach and shared decision making of the PERT concept.